Road testing Bianchi’s premium endurance offering on the nation’s highest roads. 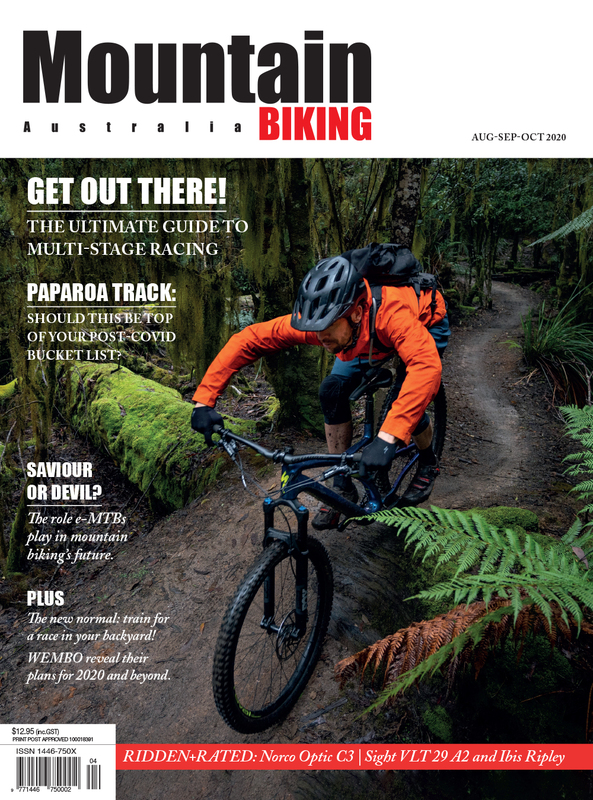 Born from the natural desire for more freedom, fewer walls, and to test bikes in the real world conditions they were designed for, Bicycling Australia have been ticking off a number of dream Aussie must-ride destinations over the past year or so. There was the Focus Paralane in and around outback Broken Hill, the 3T Exploro on the varying road and gravel surfaces near Adelaide, and the Bianchi AllRoad adventure bike tested near Charlotte Pass as the snow was falling. It’s a successful, popular and (ahem) fun formula, so we’re sticking to it. 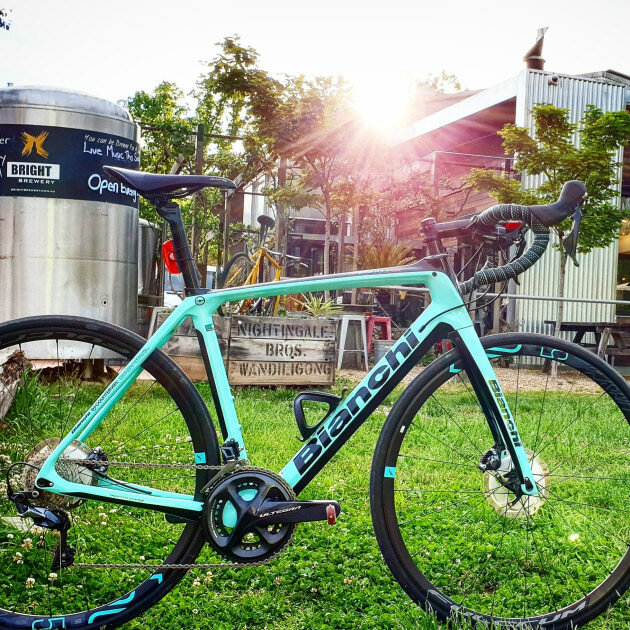 With that in mind, it was mid-October when we heard the latest incarnation of another Bianchi – the revered Infinito CV Disc – had just arrived in the country. A few days later the van was humming along the Hume Highway and heading for the dream destination of Bright. Flicking through a well-worn paperback copy of the Velominati’s Rules at the Bright Brewery that night, sipping a locally brewed bike-themed beer, and listening to that day’s war stories from tired and recovering riders, we were becoming well and truly primed for a maiden ride on the new Infinito. The 2019 Infinito CV Disc is finished in a stylish balance of gloss black and classic celeste. Heading out of town and toward Harrietville, the destination for the day was Mount Hotham. Early in the 120km return ride, still getting the feel of the bike, and not having ridden a CV Bianchi for some time, the Countervail technology felt like a return visit from a long-lost friend. Designed for comfort during long days in the saddle, the Countervail technology compliments the endurance geometry of this bike by combining carbon with a viscoelastic resin that’s said to cancel 80% of vibration. Cool weather in the high country with ice still on top of the hills when we were there testing the new Bianchi. As we know, vibration is one of the factors that leads to fatigue, so combining this ‘vibration cancelling composite technology’ to a proven endurance platform is a no-brainer. With this day’s ride – around 25km of very gradual climbing, followed by roughly 10km of serious ascent, another 10km of false flat, followed by a final brutal uphill 10km to the highest through road on the continent – the Infinito CV felt absolutely at home. With 28mm Vittoria Corsa tyres, and the bike weighing in at just under 8kg, on paper this is not the lightest specialist climbing bike. That said, and considering the big picture of spending a day aboard this steed, I found the Infinito CV to be a solid, sure-footed, stable and a supremely comfortable bike to ride. 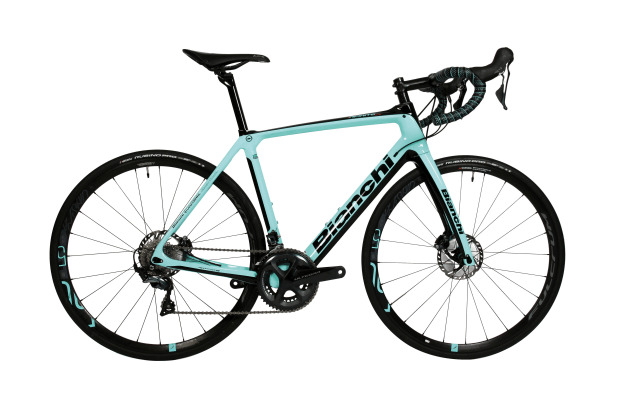 Bianchi's 2019 Infinito CV Disc, a pleasure to ride on some of Australia's best climbs and descents. 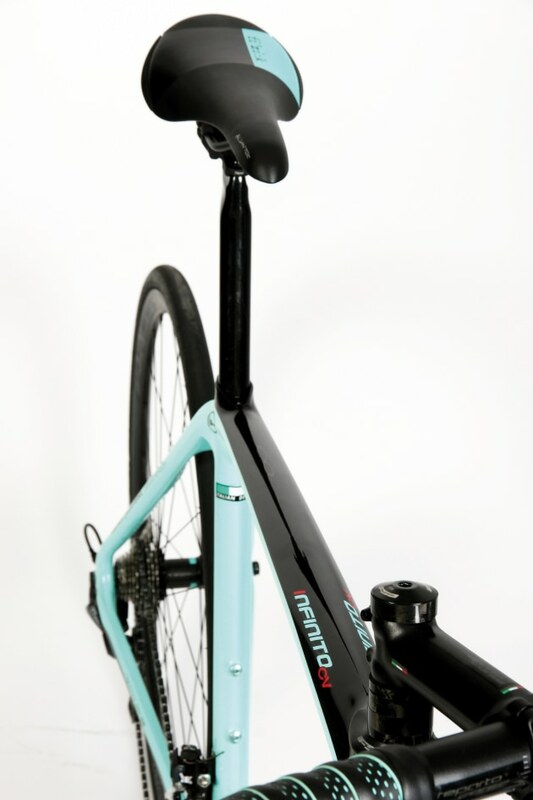 Factory fitted with Bianchi’s Reparto Corse 420mm wide alloy bars, and a Fizik saddle featuring a dash of unmissable celeste flash, I found the major contact points to be practical and perfectly fit for purpose. That said, and taking tips from that aforementioned copy of The Rules, these are only two areas of this bike where aesthetics could be considerably improved. Slightly narrower flat topped carbon bars would top my list, with a lower profile ‘less is more’ style high-quality saddle also on the order. An endurance bike that shares many attributes of its XR3 and XR4 siblings. 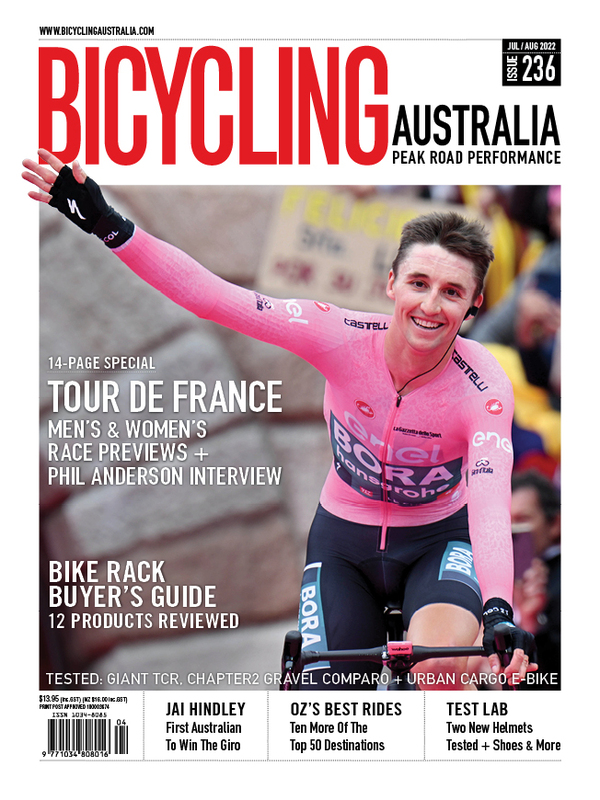 A talking point and conversation starter wherever it was taken, a local outside the general store admired the bike while explaining the popularity of the region amongst summertime cyclists … and perils of year-round life above 1,800m in Australia. 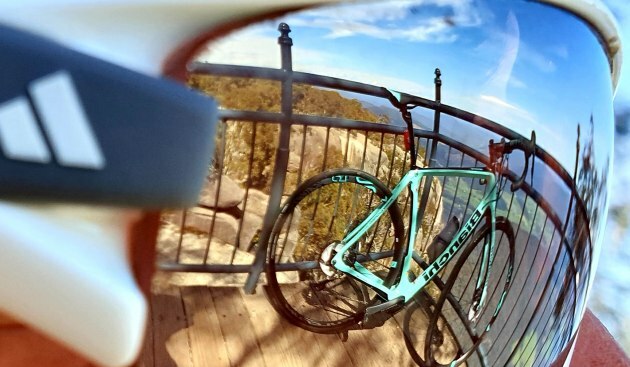 Reflections of the Bianchi at the Mount Buffalo lookout. It was late in the day, sections of the road were in shadow, single figure temperatures were starting to bite, and the road was all but empty. What lay ahead was close to 30km of snaking, relatively smooth and completely traffic-free descending. And here is where the Shimano disc brake-equipped Infinito CV absolutely came into its own. 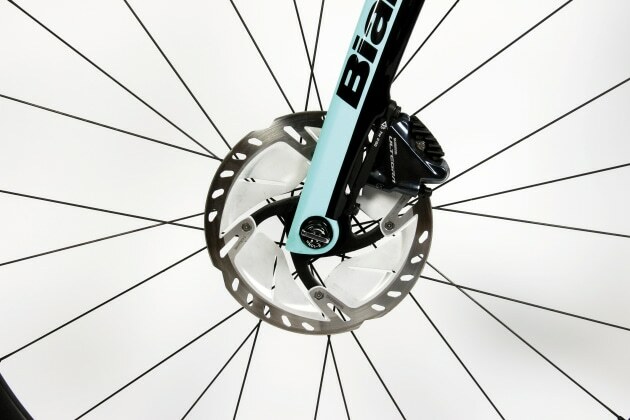 Shimano Ultegra160mm disc brakes on the 2019 Bianchi Infinito CV. 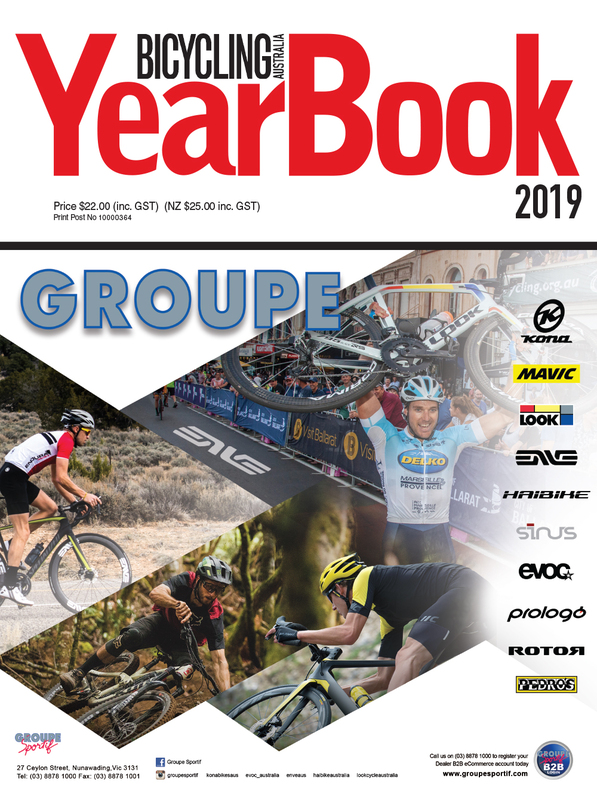 With a finger hovering above each brake lever, in the big ring and pushing hard into the seemingly endless corners, the bike literally owned the road. It clung on as if on rails, and responded to the quick lefts and rights as if it knew its way home. Solid, sure-footed, stiff, direct and in control – but a few of the attributes felt through the frame as the bike safely conveyed me back toward the Bright Brewery. Back at one of the region's 'must stop' destinations, the Bright Brewery. A legitimate mix of endurance, comfort and performance. Not so subtle signs of the benchmark-setting Bianchi XR4 - particularly in the seat tube angle, head angle and the fork. A comfortable long distance performer and surprisingly capable climber when the going gets steep. Drop into your favourite descent and thats when the Infinito’s real talents become apparent. Fine attention to detail, no visible imperfections, and a typically stunning Bianchi finish in one of their slightly lighter shades of celeste. As mentioned in the main body of the article, I would upgrade the saddle and handlebars, purely for cosmetic and aesthetic reasons. 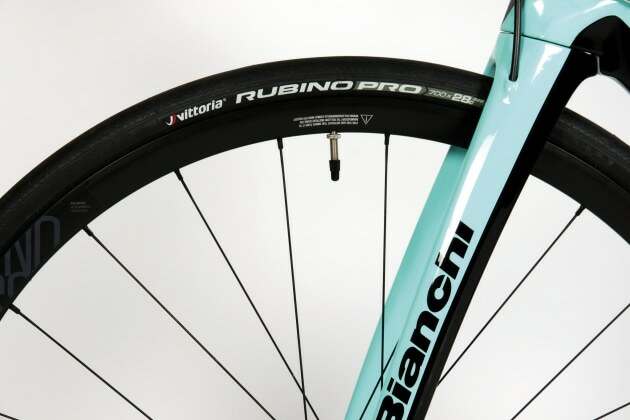 The Infinito Disc features 28mm Vittoria Rubino Pro tyres as standard. The inclusion of this Shimano Ultegra, disc brake-equipped Infinito CV in the range - and at this price point - will be a dilemma and add extra confusion to buyers in the advanced ‘endurance plus’ market. A top-quality bike that offers all-day comfort, sure-footed stability and impeccable handling. It’s a bike you will thoroughly enjoy, a bike that will make Australia’s iconic cycling locations all the more enjoyable and memorable. The Infinito disc at 'The Cross' near the top of Mount Hotham. Image: Nat Bromhead. The author at the Mt Buffalo lookout aboard the 2019 Infinito CV disc.